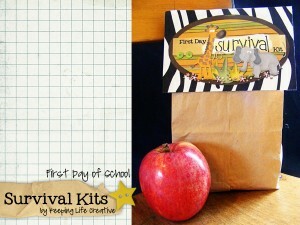 As promised, I’ve got a few First Day of School gift ideas to share with you today. If you missed part 1 of this post on how to get the new school year off to a great start with your child’s teacher, start here. If you are looking for some fun, inexpensive, and easy gift ideas to bless a special teacher on the first day of school, look no further! I have to start with my favorite way to bless a teacher or aide on the first day of school. I know I’m biased, but it truly does make such a special, inexpensive, and unique gift – “How to Pray for Your Students”. This laminated and spiral-bound book, available in the Throne of Grace Shop, offers prayers and corresponding scriptures that are specially written to bless the heart of a teacher and help guide teachers’ prayers for their students. Since my daughter is going to have the same teacher this year that my son had previously, I had to come up with a new idea this year. 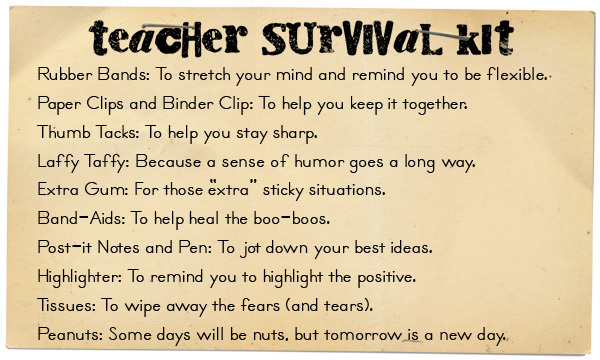 I came across these simple ideas…now I just have to decide which one to do now and which ones to save for Teacher Appreciation Week or the end of the year! There are many creative ways to package up a little survival kit. This one is in a simple brown bag. But I love the sweet note that explains the meaning behind each of the items included. How cute is this?? So simple, too! 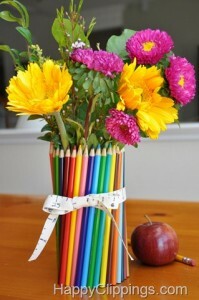 Just a couple packs of colored pencils, rubber-banded around a coffee can or jar, with a cute ribbon. 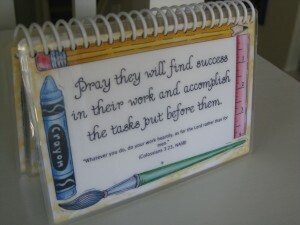 When the teacher is done with the vase, the colored pencils can be removed for use! The personalized vinyl is available for just $5 from this Etsy Shop, or make it yourself if you have a Cricut machine. 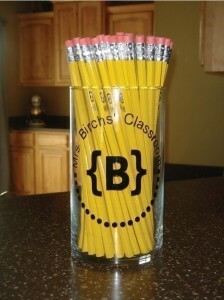 Find an inexpensive jar or vase and fill with a bunch of Dixon Ticonderoga #2 Pencils (the only pencils to use as far as teachers are concerned!) or some cool and colorful pens for correcting papers! Of course, homemade goodies are always thoughtful! Start a tradition of baking some tasty homemade muffins for breakfast on the first day and send one or two to school with a little note for the teacher. 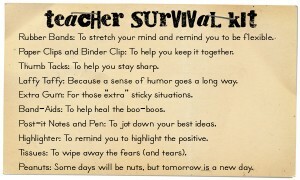 And if all the craziness of Back to School is a bit overwhelming for you, even just a simple hand-written note to encourage the teacher on the first day and let him/her know that you are on their team is a GREAT way to go! 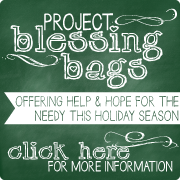 The bottom line…BE A BLESSING! !